A most exotic steel alloy. 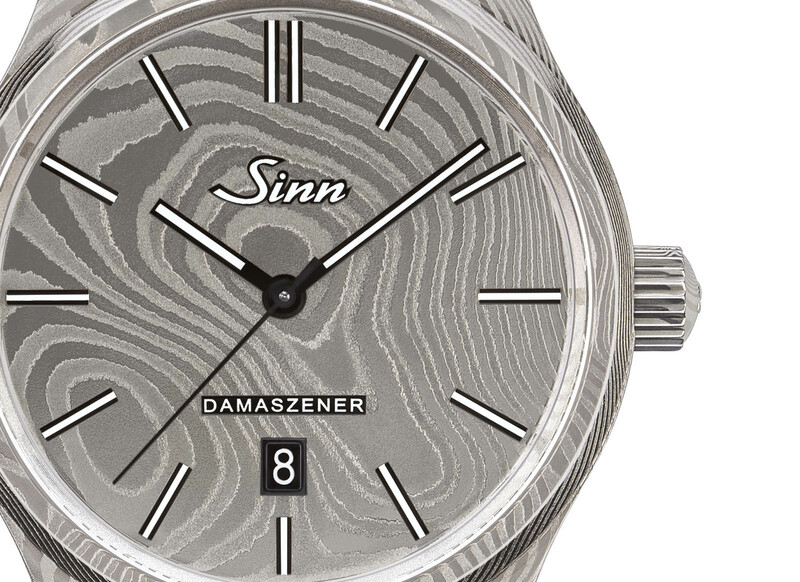 Following the 1800 S Damaszener of 2016, Sinn has just unveiled a second edition entirely in Damascus steel. As with the first model, the new 1800 Damaszener features an unusual case construction, with the case and dial being a single piece forged from a block of steel. Ancient Damascus steel is a mythical alloy once used for blades so sharp they could cut through a piece of floating silk. Believed to have originated during the Middle Ages in the Middle East and India, the technique to cast Damascus steel was all but lost during the 17th century. The modern day alloy of the same name – Damaszener stahl in German – is actually pattern welded steel, formed of several pieces of different steel alloys welded together, then drawn and folded multiple times to create a single billet that can then be worked. The result is the distinctive, layered surface that resembles woodgrain, making it a favourite material for high-end custom knives. The case of the 1800 Damaszener was made by German Damascus steel specialist Balbach Damast, located not far from Sinn’s hometown of Frankfurt. 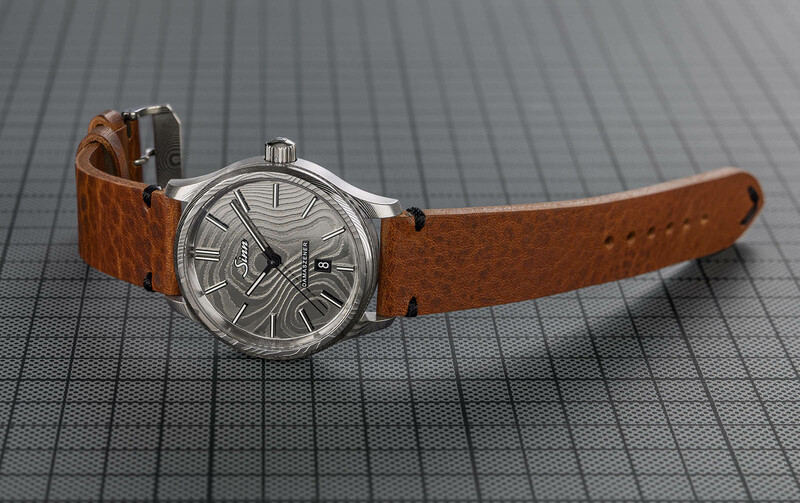 Two alloys of high grade stainless steel were forge-welded, then repeatedly folded and hammered, resulting in the undulating lines that ripple across the dial and case. 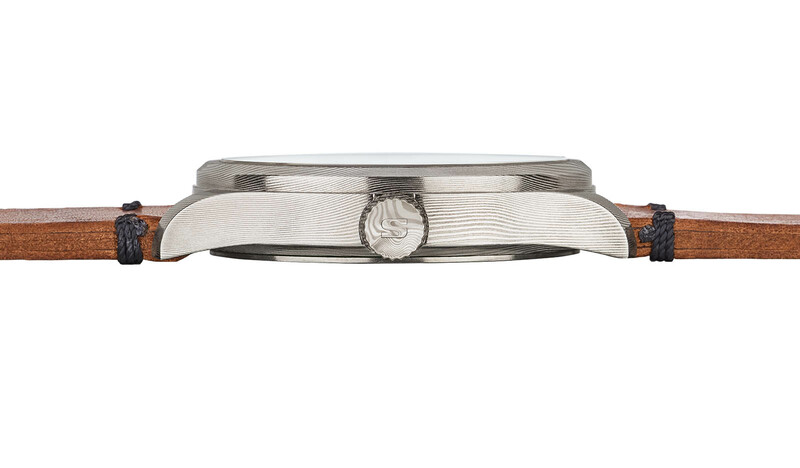 Because the case and dial are made from a single piece of steel, the surface pattern is seamless, continuing across the whole case, going from dial to bezel to case flanks. While the first Sinn Damaszener had a black coating on the case and dial, the new version leaves the steel in its natural grey colour. But the differences in the internal layers of the alloy are amplified through acid etching. Steel alloys react to acid differently, which results in differing shades of grey across the surface. 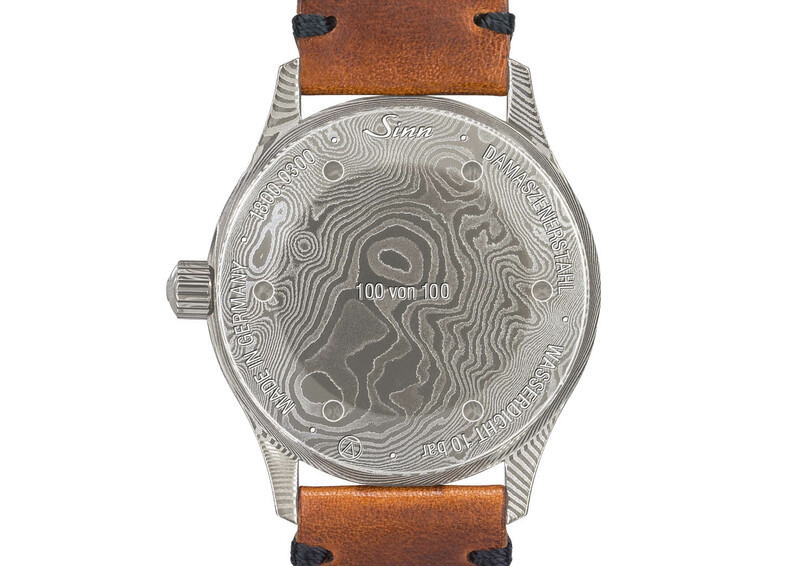 The case back – which is a separate component from the case – crown and strap buckle are also made of Damascus steel. In addition, all of the Damascus steel parts also undergo Sinn’s patented, surface-hardening Tegiment process, which strengthens its scratch resistance by changing the molecular structure of the metal surface, making it more crystalline. Water-resistant to 100m, the case measures 43mm in diameter and contains the robust ETA 2892-A2, a tried and tested self-winding movement that offers a 42-hour power reserve. The Sinn 1800 Damaszener is limited to 100 pieces and is priced at US$8580 or €7800.